With the southern border of the United States gaining a very significant portion of news coverage especially when it comes to Donald Trump's proclamations that the border region is a source of crime in the United States, a brief look at the 2018 National Drug Threat Assessment from the Department of Justice/Drug Enforcement Agency gives us interesting insight into how a border wall could impact the flow of drugs across the Mexico - United States frontier. 1.) Heroin - Mexico is the primary source of heroin - significant increases in opium polly cultivation and heroin production allow Mexican Transnational Criminal Organizations (TCO) to supply high-purity, low-cost heroin into the U.S. market as U.S. demand has increased. 3.) Methamphetamine - most of America's methamphetamines are produced in Mexico and smuggled across the Southwest Border (SWB). 4.) Marijuana - Mexico is the most significant foreign source of marijuana with the volume of seized marijuana decreasing across the SWB. Mexican drug traffickers are selling Mexico-sourced marijuana for use in THC extraction laboratories located in Southern California. Overall, the Mexican TCOs remain the greatest criminal drug threat to the United States with the Sinaloa Cartel maintaining the largest footprint in the United States. As well, in recent years, Cartel Jalisco Nueva Generacion's (based in Guadalajara) footprint in the United States has expanded substantially. "Mexican TCO activity in the United States is mainly overseen by Mexican nationals or U.S. citizens of Mexican origin. U.S.-based TCO members of Mexican nationality enter the United States legally and illegally and often seek to conceal themselves within densely- populated Mexican-American communities. Mexican TCO members operating in the United States often share familial ties with, or can be traced back to, the natal region of leading cartel figures in Mexico. U.S.-based TCO members may reside in the United States prior to being employed by a Mexican TCO. In some cases, U.S.-based TCO members are given high-ranking positions within the organization upon returning to Mexico after years of successful activity in the United States." "Mexican TCOs transport the majority of illicit drugs into the United States across the SWB using a wide array of smuggling techniques. The most common method employed by these TCOs involves transporting illicit drugs through U.S. POEs (official Points of Entry) in passenger vehicles with concealed compartments or commingled with legitimate goods on tractor trailers. In some instances, regardless of method, the size of the loads has decreased, while the number of them has increased. Mexican TCOs exploit various aerial methods to transport illicit drugs across the SWB. These methods include the use of ultralight aircraft and unmanned aerial systems (UASs) and drones to conduct air drops. Ultralights are primarily used to transport marijuana shipments, depositing the drugs in close proximity to the SWB. Currently, UASs can only convey small multi-kilogram amounts of illicit drugs at a time and are therefore not commonly used, though there is potential for increased growth and use. Mexican TCOs also use UASs to monitor the activity of U.S. law enforcement along the SWB to identify cross-border vulnerabilities." "In 2017, heroin from Mexico accounted for 91 percent (by weight) of the heroin analyzed through the DEA’s HSP. The annual United States Government estimate of Mexican Poppy Cultivation and Heroin Production found poppy cultivation reached a record high in 2017. Poppy cultivation in Mexico rose 38 percent, from 32,000 hectares in 2016 to 44,100 hectares in 2017. Similarly, potential pure heroin production increased by 37 percent, from 81 metric tons in 2016 to 111 metric tons in 2017. The SWB remains the primary entry point for heroin into the United States. Most of the heroin seized by Custom Border and Protection (CBP) occurs along the U.S.- Mexico border near San Diego, California. In 2017, approximately 1,073 kilograms of heroin were seized in the San Diego corridor, a 59 percent increase over the total seized in 2016. A small percentage of all heroin seized by CBP along the land border was between Ports of Entry (POEs). 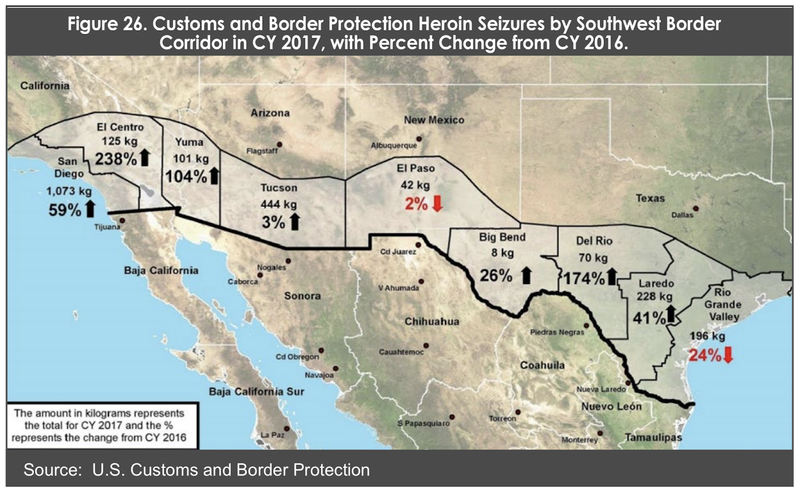 The CBP San Diego sector reported the greatest amount of heroin seized of all non- POE land border seizures, followed by the Tucson sector." 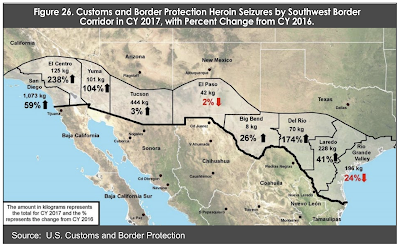 "Mexican TCOs control the movement of heroin that enters the United States across the SWB, until it reaches its destination in cities all over the United States. The majority of the flow is through POVs entering the United States at legal ports of entry, followed by tractor-trailers, where the heroin is co-mingled with legal goods . Body carriers represent a smaller percentage of heroin movement across the SWB and they typically smuggle amounts ranging from three to six pounds taped to their torso, or in shoes and backpacks." "The majority of the cocaine and heroin produced and exported by Colombian TCOs to the United States is transported through Central America and Mexico. Colombian TCOs export large cocaine shipments to Mexico, Central America, and the Caribbean, using a variety of maritime and aerial means to include speedboats, fishing vessels, private aircraft, semi-submersibles, and commercial air and sea cargo." "While seizures likely originating in Mexico represent the largest total gross weight of fentanyl seized in the United States, the overall low purity of this fentanyl means a relatively small portion of a given fentanyl seizure is actually fentanyl. Fentanyl sourced from China arrives in significantly smaller quantities than fentanyl sourced from Mexico, but due to its exceptionally high purity, it both poses a greater risk to the purchaser/user and can be adulterated many more times. DEA reporting also indicates Mexican traffickers order fentanyl from China, adulterate it, and smuggle it into the United States themselves, meaning an unknown amount of seized Mexican parcels containing fentanyl are ultimately of Chinese origin. In addition, Mexican traffickers’ primary source of supply for fentanyl precursor chemicals is also China." "Fentanyl trafficked by Mexican TCOs is typically in multi-kilogram quantities and is combined with adulterants in clandestine facilities in Mexico prior to it moving into the SWB region. 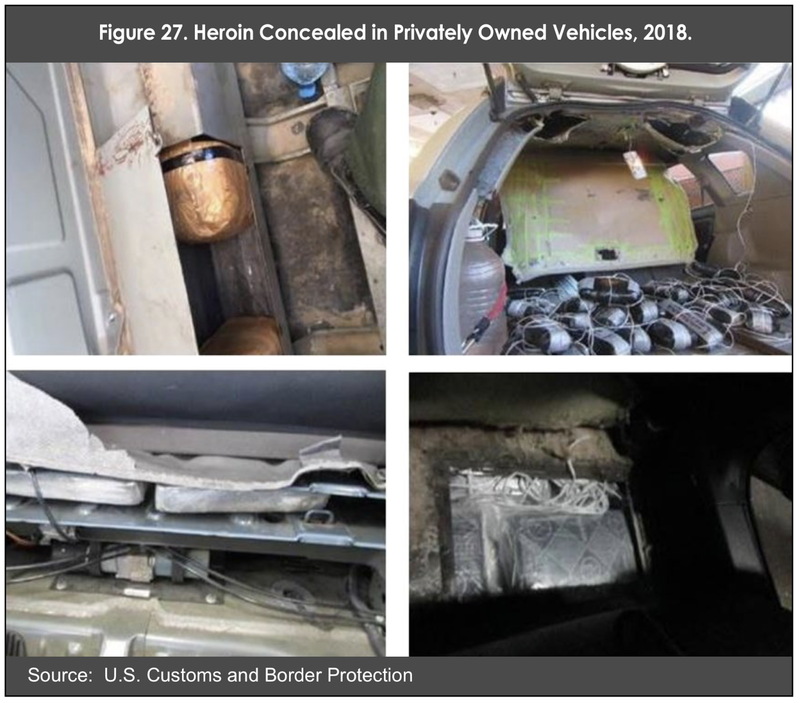 Mexican TCOs most commonly smuggle the multi-kilogram loads of fentanyl concealed in privately owned vehicles (POVs) before trafficking the drugs through SWB POEs. According to CBP and DEA reporting, although fentanyl is often seized as a part of poly drug loads (generally cocaine, heroin, and methamphetamine), fentanyl mixtures with other illicit drugs are very uncommon at the wholesale level." "Fentanyl seizures at SWB POEs increased by 135 percent— from 223 kilograms to 524 kilograms— between CY 2016 and CY 2017. The CBP San Diego Field Office AOR remains the primary entry region for fentanyl entering the United States via the SWB (see Figure 41). 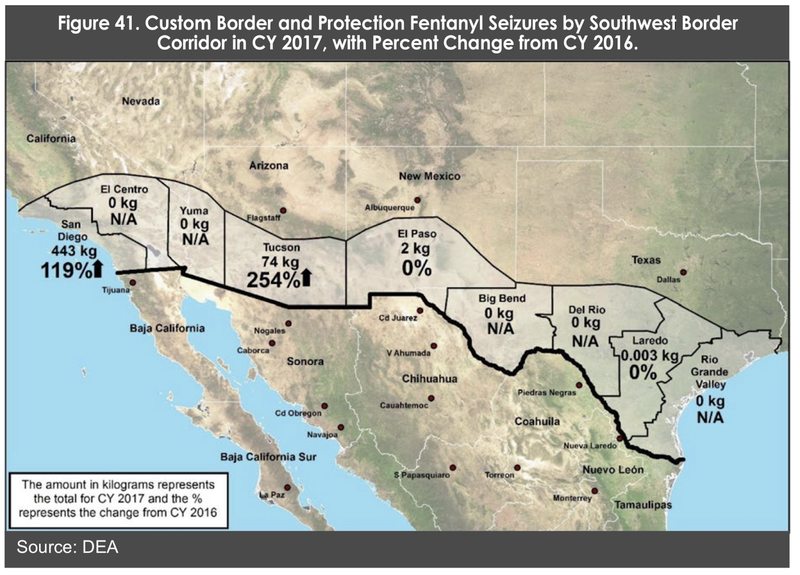 Approximately 85 percent of the fentanyl seized— 447 kilograms of 524 kilograms— entering the United States via the SWB flowed through the San Diego POE in CY 2017. During this timeframe, personally operated vehicles were the conveyance for 74 percent of the fentanyl seized, by weight, at SWB POEs. The second largest volume of flow— 14 percent of all the fentanyl seized along the SWB— was seized in the CBP Tucson Field Office AOR in CY 2017. 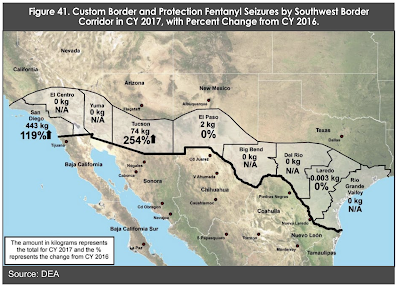 In comparison, during CY 2016, the CBP San Diego Field Office AOR accounted for 91 percent of all the fentanyl seized along the SWB and the CBP Tucson Field Office AOR accounted for nine percent." While I realize that the volume of drugs seized at the Southwest Border is likely a small fraction of the total drugs that cross the Mexico - United States border, it is interesting to see that the vast majority of both heroin and fentanyl is seized at official points of entry from either transport trucks or personal vehicles with only small volumes of these drugs being seized from individuals crossing the border illegally at points between official border crossings. This would seem to indicate that the building of a continuous border wall will have relatively minimal impact on the volume of drugs imported into the United States from Mexico. While a wall will make it more difficult for individual drug mules to smuggle relatively small volumes of illicit drugs into the United States, a wall is not going to stop people from importing illicit drugs using transport trucks, buses, personal vehicles and the myriad of other methods that involve crossing the border at official crossing points. While I agree a wall across the Mexican border will do little to reduce drugs entering America, the wall is more about immigration. Drugs are about money. In truth, those opposed to Trump should be ecstatic about Trump's offer to extend DACA and protection to some 300,000 immigrants for three years. If immigration advocates are confident their numbers will grow and Trump will not win a second term, they would then have the opportunity to resolve immigration issues strongly in their favor. As for the recent "partial government shutdown," it was poorly crafted. Since most government workers will likely be granted retroactive pay for their time off, politicians are stupid or silly if they think paying government workers to stay home over a few billion dollars in a 4.4 trillion dollar budget makes any sense. It did nothing to address costly immigration issues while being costly to taxpayers. More on this issue in the article below.